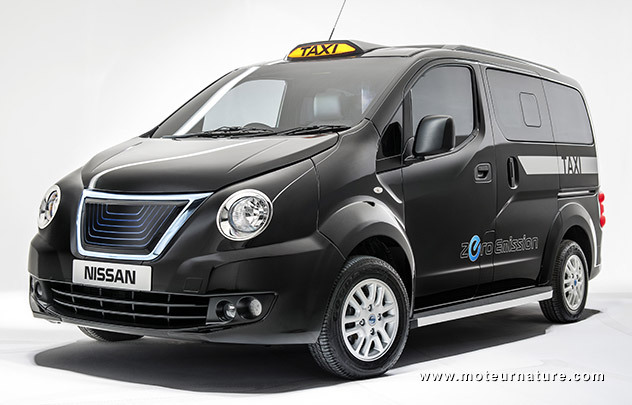 Nissan unveils a taxi for London, will cabdrivers like it? The Nissan NV200 is a small van, and there’s a family version (with windows) that sells with the name of Evalia. It’s that Evalia which was the base for this vehicle, specifically designed to be a taxicab in London. It has two main differences compared to the standard Evalia. The first is obviously the front grille, which looked like it’s the work of some inexperienced Chinese designer. The standard NV200 may be too bland, but at least it’s smooth! The front track then, has been totally reengineered because of a legal requirement for taxicabs in London. They must have a very short turning radius. The stock Nissan didn’t comply, and the wheel wells were too narrow to allow any improvement. The front track had to be widened to give room, so that the wheels could turn more. That was substantial work, but Nissan didn’t work as much on the powertrain. There will be a choice of two. Our illustration shows the electric version, which uses the motor and battery from the Leaf, but it won’t be available at first. Few drivers may miss it though. With more weight and much worse aerodynamics than the Leaf, its performance and range will be barely adequate for a cabbie. London needs many fast charging stations before those electric black cabs are put into regular service. So there will be a gas version, with a 1.6-liter and a CVT. That doesn’t sound like much. In New York which also has those Nissan taxis (with the standard front end), the manufacturer has chosen a 2-liter engine. The 1.6-liter only gives 113 lb-ft of torque, and it comes at a high 4400 rpm. A diesel engine would give twice that at half the speed. If drivers were given the choice, they’d go for the diesel, could Nissan make it?